Before we get in too deep with an exploration of all the new TV shows coming to our screens this Fall season, there's still plenty of time for networks and studios to campaign in the skies of L.A. and try to win enough Emmy votes to take home some of the prestigious industry award accolades. 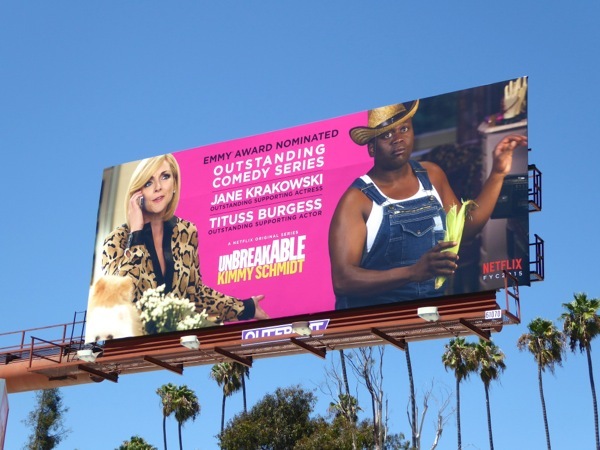 Netflix didn't really campaign during the 2015 Emmy consideration period, only the freshman comedy Unbreakable Kimmy Schmidt seemed to receive any noticeable support, but now that the nominations have been announced they're supporting their stars and shows with a vengeance. 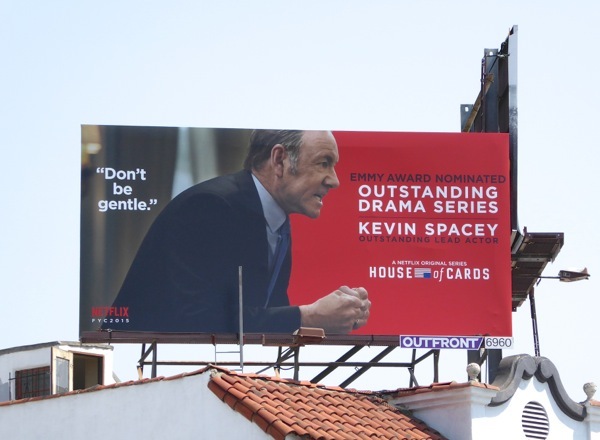 They've also taken a leaf out of HBO's Emmy consideration billboards by giving their outdoor ad campaign a cohesive brand design for all the original shows and films in their stable. Each offering has its own individual bold colour scheme and prominent quotes from the show itself, plus the nominated category or actor is clearly presented. There's a lot to cram in, but it works. 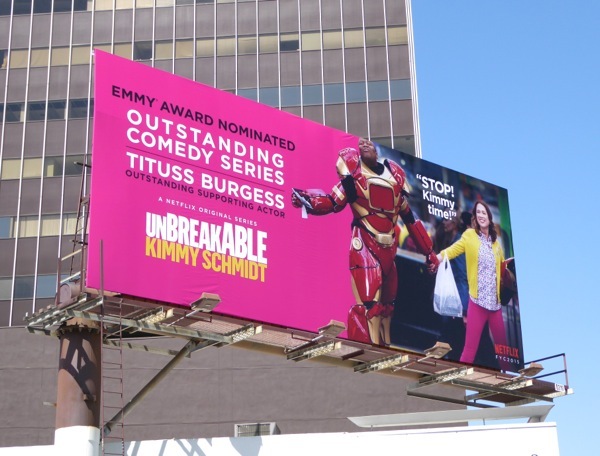 Take for example the support for rookie comedy Unbreakable Kimmy Schmidt, which really stands out with these hot pink billboards. 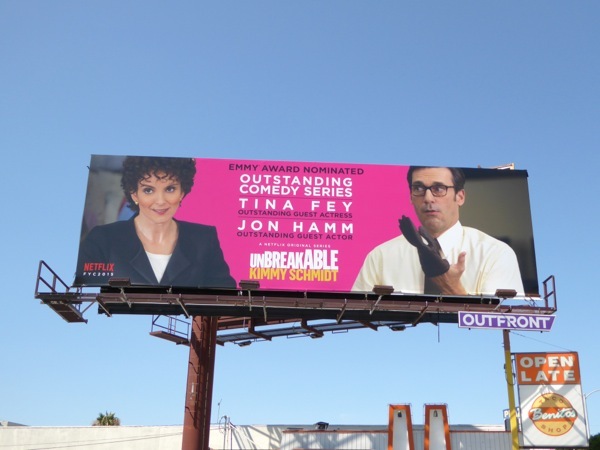 There's even additional outdoor ad support from the production studio, Universal Television, for the comedy about a woman who escaped captivity and was given a new lease on life, which has garnered seven Emmy nominations. 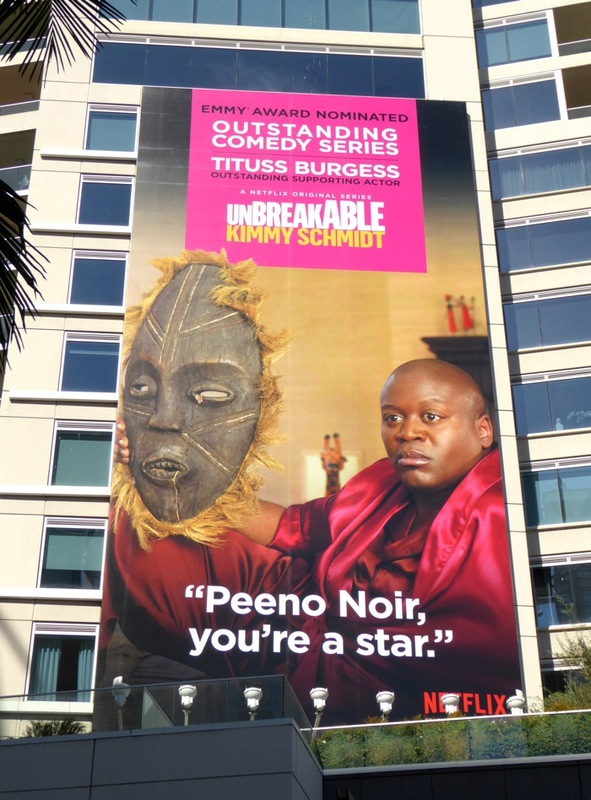 These Kimmy billboards were snapped from August 8 to August 15, 2015, along La Cienega Boulevard, Pico Boulevard, Santa Monica Boulevard, Wilshire Boulevard and Hollywood Boulevard. 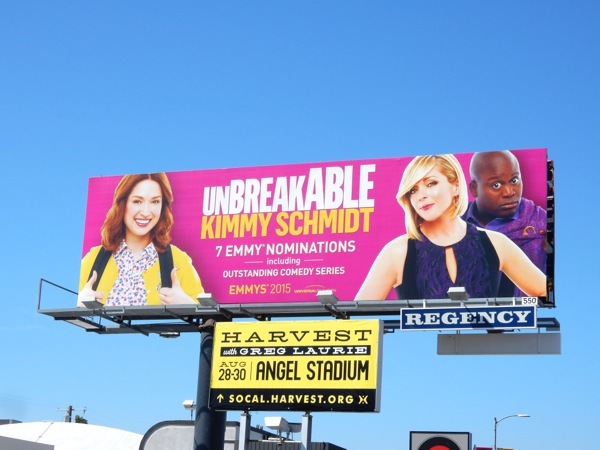 From the looks of all these ads, someone really wants to win an Emmy. 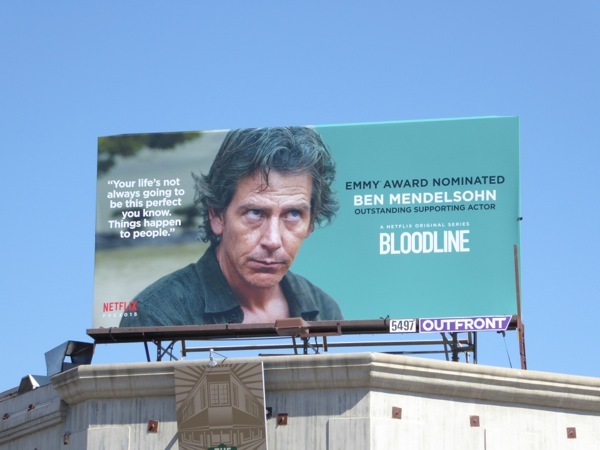 Next up is another new series on Netflix, the family drama Bloodline, with Kyle Chandler and Ben Mendelsohn both receiving nominations, for Outstanding Lead Actor and Outstanding Supporting Actor respectively, for their portrayal of troubled siblings with their fair share of dark secrets. 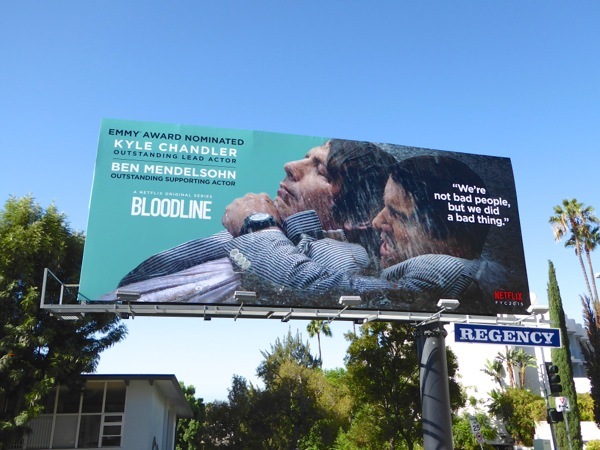 These dramatic Bloodline Emmy nomination billboards were photographed along the Sunset Strip on August 13, plus the smaller ad along Highland Avenue on August 15. It was slow going, but gripping stuff and you can see why these two actors received their nominations. The jewel in Netflix crown, House of Cards returned for a third magnificent season earlier this year and the binge-worthy series about political scheming in the White House was nominated for eight Primetime Emmys. Can Kevin Spacey and Robin Wright take home an Emmy to join their Golden Globes for their portrayal of do-whatever-it-takes power couple, 'Francis and Claire Underwood'. 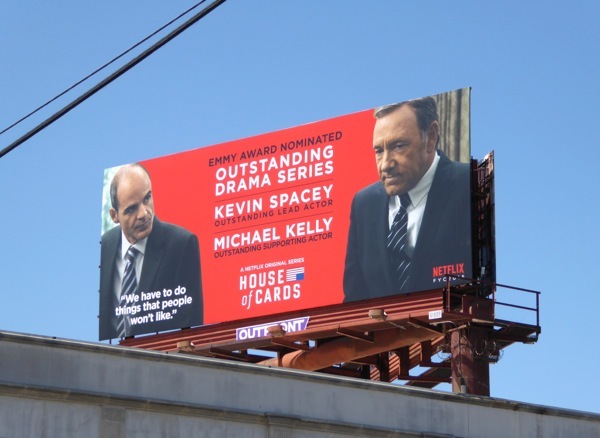 These bold red House of Cards billboards, featuring pivotal moments from the show, were snapped above La Brea Avenue on August 12 and along L.A.'s Sunset Strip on August 16, 2015. 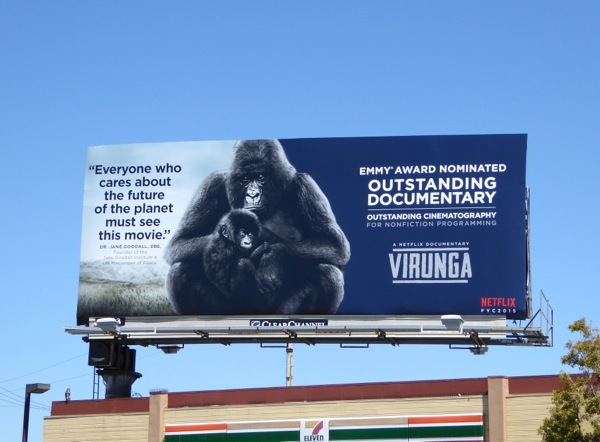 Next is billboard support for the Netflix documentary Virunga, about the last of the world's mountain gorillas living in the wild in the war-torn Congo, directed and written by Orlando von Einsiedel. 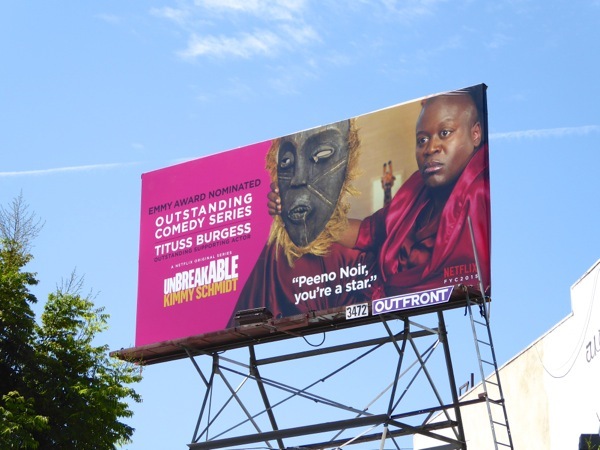 This emotive Emmy nomination billboard was spied on August 12 along Pico Boulevard at La Brea Avenue in one of Netflix regular ad sites. This year a new TV Academy rule deemed all half hour shows 'comedies' and all hour-long series 'dramas', Orange is the New Black became the first show to be nominated for both Outstanding Comedy Series and Outstanding Drama Series. 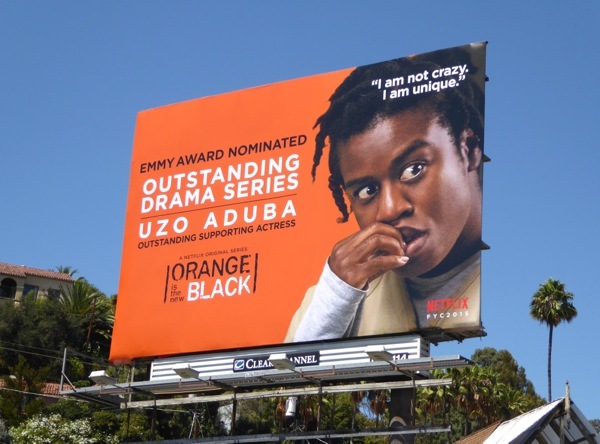 Now in its third season, the women's prison drama garnered four nominations, including one for Uzo "Crazy Eyes" Aduba for Outstanding Supporting Actor. 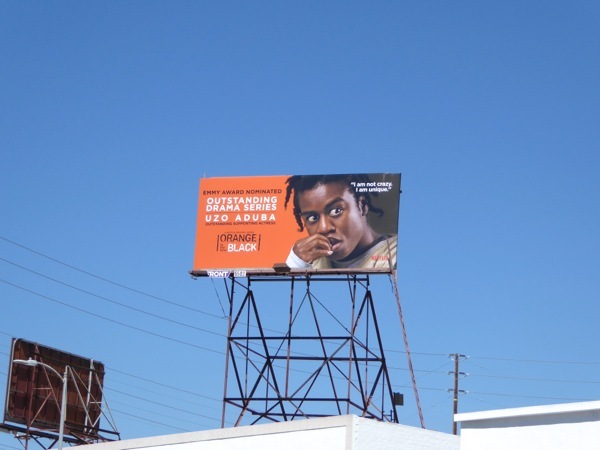 These eye-catching, appropriately orange billboards featuring the actress were spotted along Sunset Boulevard and Santa Monica Boulevard on August 15. After two seasons, Ricky Gervais was back in a special for his quirky comedy Derek, in which he plays a rather simple healthcare worker at a nursing home for the elderly. 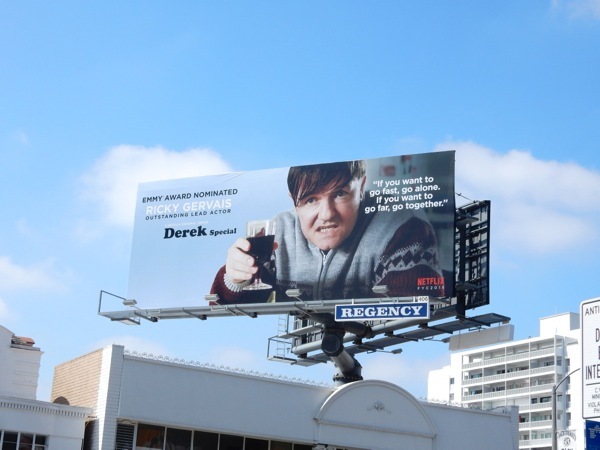 This Emmy nominated Derek Special billboard was snapped along the Sunset Strip in West Hollywood on August 11. 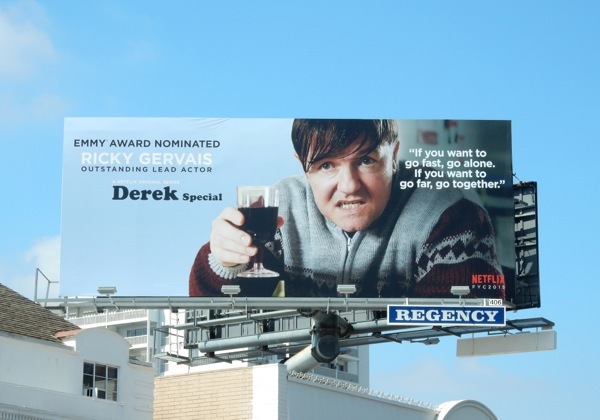 If you're a fan of the show and actor, you should also check out the billboard for the Derek Special which parodied the Fifty Shades of Grey advertising campaign. 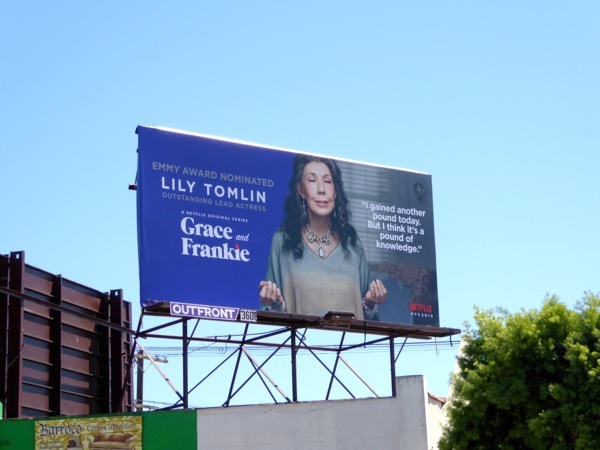 And last, but by no means least, here are billboards for Grace and Frankie, Netflix comedy about two women in their seventies brought closer together when their husbands decide to leave them to get married to each other. 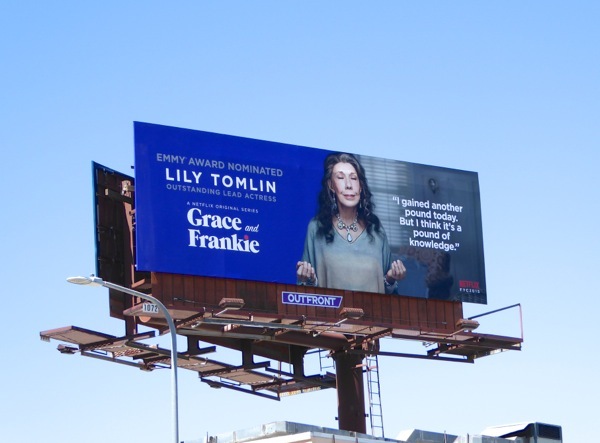 The series reunited 9 to 5's Jane Fonda and Lily Tomlin on the small screen after all these years, but it was Tomlin and her portrayal of the peyote-taking artist 'Frankie' that received an Emmy nomination. 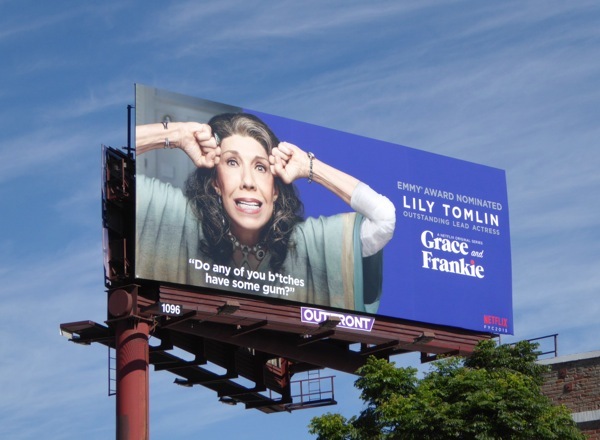 These billboards wonderfully illustrating different sides of her character's personality, calm and frantic, were spied on August 12 and August 16 along Westwood Boulevard, Sunset Boulevard and Pico boulevard. 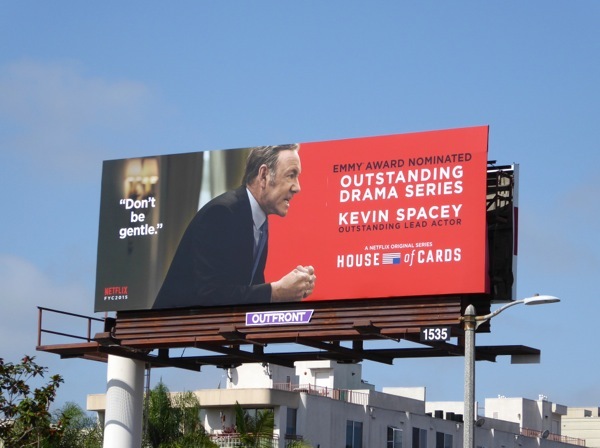 Daily Billboard is sure we'll spy more ads in this outdoor campaign before the winners are announced, but until then be sure to also check out last year's Netflix Emmy nomination billboards. Plus come back in the days to come to see even more Emmy nomination billboards in the skies of Los Angeles vying for TV Academy member attention and votes. 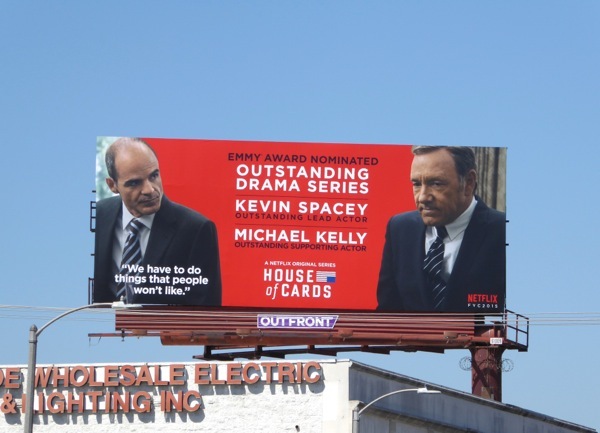 UPDATED: As expected here are two more billboards from the Netflix Emmy nomination campaign. 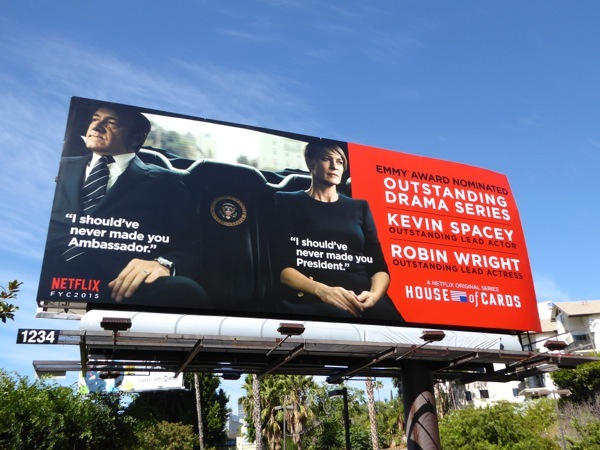 First up is another House of Cards billboard, this one shining a spotlight on Kevin Spacey's President, spied along La Brea Avenue on August 19, 2015. 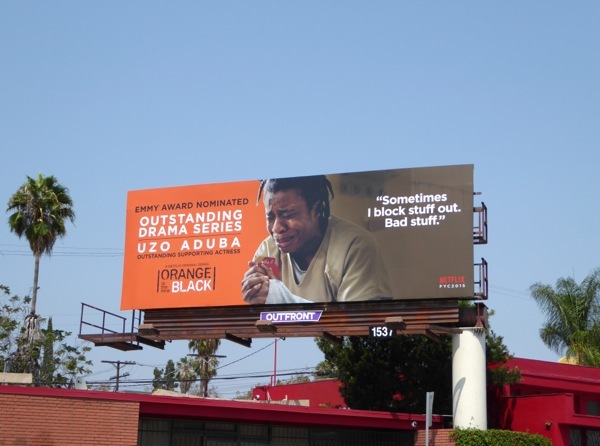 Next up is pretty powerful Emmy billboard creative for Orange is the New Black and Uzo Aduba and her portrayal of her mentally troubled inmate, spotted along Melrose Avenue on the same day. 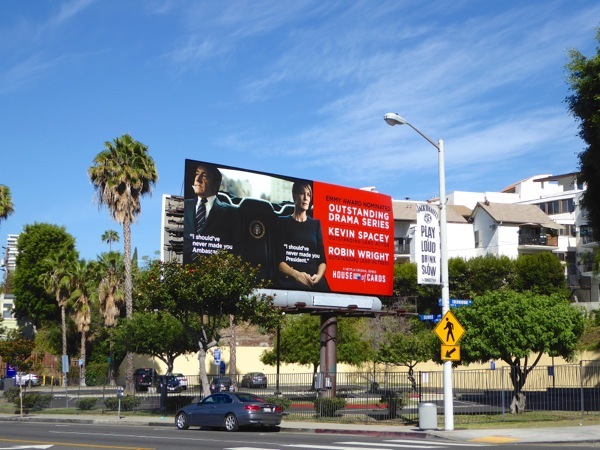 Plus here's another larger Kevin Spacey billboard snapped along Beverly Boulevard on August 23, 2015. 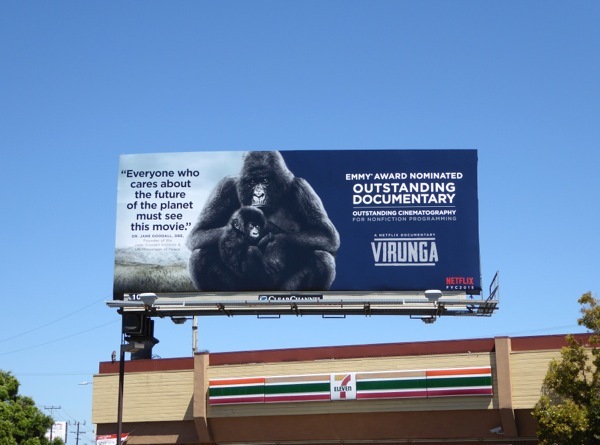 Virunga is a masterpiece. The whole world needs to see what happens to the animals in times of war. Such an eye-opener! Excellent and well done to the camera crew.